The Nature Crawl will be held at four Arlington parks on Nov. 23. Above, hikers explore the Southwest Nature Preserve in Arlington. Photos by Jim Domke. An Arlington resident wants to entice residents to ditch the Black Friday sales and tear the kids away from their video games and go outside next Friday, Nov. 23, for a Nature Crawl. 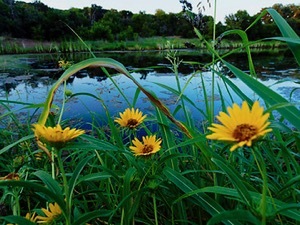 Jim Domke, a former photo editor and writer for the Fort Worth Star-Telegram, aims to introduce folks to four nature parks he describes as hidden gems in Arlington. “These [parks] are real nature parks, not just a sidewalk around the basketball court or soccer field. They take you out of the urban landscape and back into native woods, blocking out concrete,” said Domke. 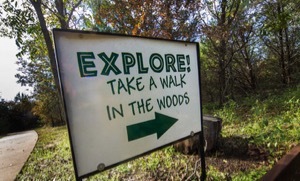 A sign points out the wooded trail at O.S. Gray Natural Area. Domke, like many baby boomers, grew up spending a lot of time outdoors and is repelled by the idea of exercising in a gym. He said strolling through parks is a great way to not only improve your health but enjoy the sights and sounds of nature - and at no cost. The Crawl starts at 9:30 a.m. at O.S. Gray Natural Area, 2021 G. Abram Street. At 10:15 a.m., participants will gather at Molly Hollar Wildscape at Veterans Park, 2866 Spanish Trail. The next stop is Southwest Nature Preserve, 5201 Bowman Springs Road at noon. The crawl ends at River Legacy Parks, 701 NW Green Oaks Blvd at 2 p.m.
Signs at the parks will direct participants to different trails. Volunteers will be on hand to point out each park’s unique features and native plants. If anyone gets hungry, J. Gilligan’s Bar & Grill, 400 E. Abrams St., is offering a discounted lunch. Also, supporting businesses offering discounts to Nature Crawl are Wild Birds Unlimited, Arlington Camera, Mountain Sports, Bicycle’s, Inc. and The Runner Shop via coupons. The pond at Southwest Nature Preserve. Nature Crawl is scheduled in conjunction with REI’s Opt Outside campaign. All aforementioned parks need more volunteers. If interested, contact Domke at jim.domke@gmail.com. In case of inclement weather, the Nature Crawl will be cancelled. 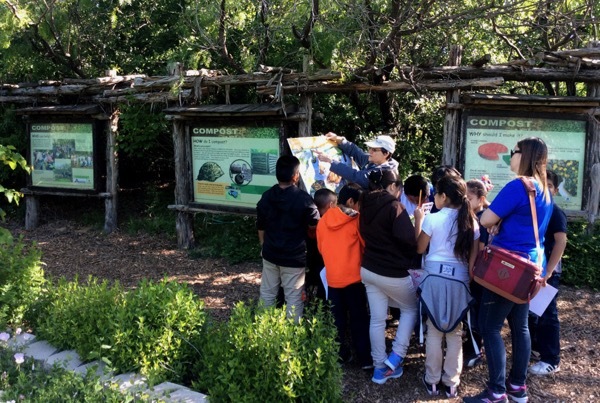 All DFW cities have parks that offer places to play baseball, soccer and basketball, but with research, you'll find that many of them, like Arlington, offer nature parks. The Molly Hollar Wildscape at Veteran's Park is a stop on tour. When: Nov. 23, 2018, 9:30 a.m. to 2:30 p.m.
9:30 a.m. at O.S. Gray Natural Area, 2021 G. Abram Street. 10:15 a.m., Molly Hollar Wildscape at Veterans Park, 2866 Spanish Trail. 2 p.m. River Legacy Parks, 701 NW Green Oaks Blvd at 2 p.m.